Have you ever ready a book and thought, “I found my people! Suddenly I understand!”? That is how this book made me feel. Multi-potentialites – a term coined by Wapnick – are people who are interested in many things; people who are not fulfilled by developing deep expertise in one thing. Multi-potentialites see the intersection of disciplines and are energized by exploring all the world has to offer. The same is true for people described in "The Medici Effect." Published in 2004 by a Swedish American entrepreneur, "The Medici Effect" has influenced labor and industry by inspiring new perspectives and encouraging businesses to embrace diversity. 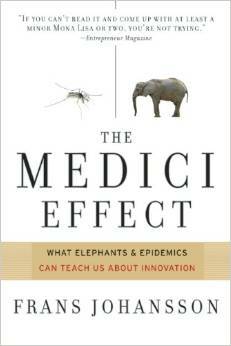 "The Medici Effect" urges that embracing diversity is not a good idea simply because it is the right thing to do (which it is); it is a good idea because it makes good business sense. In fact, it is a good idea because it is the single-most important factor to new discovery. It is the key to exponential, innovative growth. Diversity is key because someone who comes from a different perspective, someone who isn’t bound by the unspoken rules and common understandings of a specified way of thinking, is capable of seeing new intersections between disciplines. Someone with a new perspective can think outside the box, because they don’t even see the box. When this happens, businesses and people are capable of radical innovation and exponential change. "The Medici Effect" explains that this radical development happened when Nobel laureate and astronomer-physicist Luis Alvarez began to consider why the dinosaurs died. His background allowed him to consider the planetary forces that might cause massive destruction on a global scale. He was not a paleontologist or biologist. He was not bound by the limitations of those fields. He used his planetary and physics knowledge, applied it to dinosaur extinction, and saw an intersection that others had missed. At HLG – we work at the intersection of business and government. We are multi-potentialites and Medicis. We view the world differently, so you can too. The Medici family led Florence Italy into and through the Renaissance period from the 14th to the 17th centuries, bridging the distance between the Middle Ages and modern history. See https://www.history.com/topics/renaissance/medici-family. Renaissance men and women were well educated, sophisticated, and developed their talents and knowledge in many different fields of study. See also https://www.yourdictionary.com/renaissance-man-or-woman.